Born and raised in Charleston, SC, Rucker was exposed to the sounds of Otis Redding, Al Green, and Gladys Knight at an early age. Those rhythm & blues icons helped reputation Hootie & the Blowfish’s recordings, all of which emphasized Rucker’s soulful baritone, but it wasn’t until the singer’s solo career that he truly paid homage to the sounds of his youth. Rucker planned to jump-start his solo career with The Return of Mongo Slade, which was slated for a summer 2001 release by Atlantic Records, but contractual changes prevented the album’s release. A few months later, Rucker jumped ship for Hidden Beach Recordings, which then earned the master recordings of his debut from Atlantic. After making a cameo in the Farrelly brothers’ movie Shallow Hal, Rucker connected his mellow, R&B-influenced style with 2002’s Back to Then, which featured collaborations with Jill Scott and Snoop Dogg. Rucker then came back his attention to Hootie & the Blowfish, releasing two units with the ensemble while the early 2000s, before revisiting his solo career. This time, he opted for a country approach, and the twangy Learn to Live found an appropriate home among country music fans (who sent both the record and its flagship single, “Don’t Think I Don’t Think About It,” to the top of the Billboard country charts). Darius Rucker has always fearlessly followed his own musical muse while cultivating a huge following of people drawn to his uniquely seductive delivery. He makes it seem effortless, until you step back and take in the magnitude of the music and the far-reaching, lasting impact of songs that have become part of popular culture. Second single, “For The First Time,” at Country radio now. On the heels of his eighth No. 1 Country single Darius Rucker has responded to fans’ appeals for new music with an announcement on the TODAY Show this morning, letting them know they won’t be waiting much longer for a new album from the 3-time GRAMMY winning star. When Was The Last Time, the long-awaited fifth studio country album on Capitol Records Nashville, will be released nationwide Friday, October 20. Fans can preorder the album beginning today at http://umgn.us/DariusPreOrder. The Platinum-selling star released the album’s second single, a song he wrote with Derek George and Travis Hill, “For The First Time” to Country radio just yesterday, Monday, July 24. “For The First Time” is the follow-up to his most recent No. 1 single, “If I Told You, marking eight country No. 1 singles for Rucker since his country music debut in 2008. Earlier this week, Rucker spoke with Billboard about teaming up with esteemed Nashville producer Ross Copperman (Dierks Bentley, Brett Eldredge, Keith Urban) to bring his vision for the album to life. “On top of being a genius with the equipment, Ross is so high-energy and funny; that kid is never not laughing.” He added, “Every time we were in the studio we had a great band who had great ideas of their own, so it was the farthest thing from tedious, but just, let’s get in and do it. I think for the whole record we spent just three days tracking music.” This fall’s release will be yet another signature moment in the multiplatinum career of one of music’s most beloved figures. Rucker has never been busier while working on his new album with a slate of television appearances this spring and summer including a CMT Crossroads episode with John Mellencamp, an appearance in Adam Sandler’s Netflix original, Sandy Wexler, and his own episode of Celebrity Undercover Boss on CBS. Rucker, an avid golfer and passionate fan of the game, will host a new monthly show in SiriusXM’s 23/7 golf channel, SiriusXM PGA TOUR Radio. On Par with Darius Rucker will debut tomorrow, July 26 at 3pm ET. The pre-order packages available include exclusive merchandise and the option to receive an autographed copy. For more information about new music, appearances and tour dates, please visit www.dariusrucker.com. 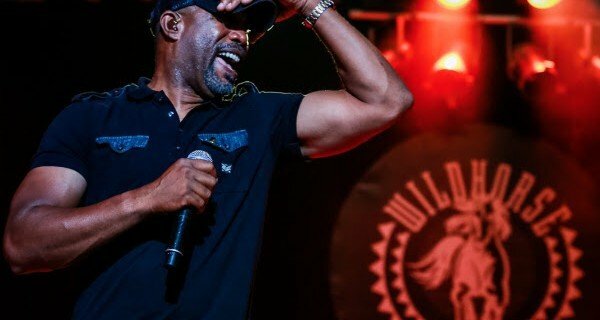 CAPITOL NASHVILLE artist DARIUS RUCKER has partnered with 843 WHISKEY to develop his own signature brand, BACKSTAGE SOUTHERN WHISKEY. RNDC DISTRIBUTING will introduce RUCKER’s brand in his home state of SOUTH CAROLINA, with distribution to follow in GEORGIA, KENTUCKY, and TENNESSEE. What has become a “good luck” tradition for RUCKER before every show is a whiskey toast with tour mates, band, and any special guests backstage. Through the years, the pre-show toast has become a significant tradition for RUCKER and his crew. “That toast is a vital part of our nightly routine,” said RUCKER. While BACKSTAGE SOUTHERN WHISKEY enters the marketplace in SOUTH CAROLINA, RUCKER’s bourbon brand, FORBIDDEN, is crafted at CASTLE & KEY DISTILLERY in FRANKFORT, KY.
NBC Today show original segment on 3/31 + “CMT Hometown Heroes” to air 3/31 Rucker to make appearance in Sandy Wexler, an Adam Sandler Netflix Comedy Movie 4/14 Darius Rucker made headlines this week as a proud Charlestonian championing his beloved South Carolina Gamecocks as they advanced to the Final Four in the NCAA Men’s Basketball tournament; however, sports teams are not all he supports locally. This week, Rucker brings CMT and Today show cameras to his hometown of Charleston, S.C. to present a brand-new, one-hour special, “CMT Hometown Heroes.” Featuring some of country’s most prolific storytellers, including Rucker, Chris Stapleton, and Brett Eldredge, these artists make surprise returns to their hometowns to give back and perform for their very own hometown heroes. During his visit to Charleston, Rucker remodeled the teen room at MUSC Children’s Hospital. Rucker’s mom was a nurse at the hospital, so he grew up visiting the facility, its staff and patients from an early age. The special premieres Friday, March 31 10 p.m. ET/PT and features exclusive performances, in-depth interviews, as well as an intimate look at the people and places that shaped each performer. NBC’s Today show was on-site for the special taping and will air an original segment on Thursday, March 30 9:00 a.m. ET focusing on Rucker’s lasting impact and philanthropic work at the children’s hospital. Rucker is putting the finishing touches on his album expected for release later this year—his first single off his forthcoming fifth studio album, “If I Told You,” is currently Top 20 and climbing—but he is still making time for film and series appearances. On an episode of “Sun Records” on CMT, Rucker will appear in black-and-white striped prison garb, playing the role of The Prisonaires’ Johnny Bragg, singing “That Chick’s Too Young to Fry” (available on-demand now). Another not-to-be-missed CMT appearance is Rucker’s “CMT Crossroads” with John Mellencamp which premiered exclusively on CMT on March 24. The pair of GRAMMY winners delivered rockin’ performances of “Pink Houses,” and “Cherry Bomb,” as well as “Wagon Wheel” and “If I Told You.” Fans can also see Rucker as he plays himself in the third installment of Adam Sandler’s Sandy Wexler, a Netflix original, beginning April 14. For more appearances, performances and tour dates, stay tuned to DariusRucker.com. The second annual Pepsi SpringJam, set for April 28 & 29, 2017 at Aaron Bessant Park in beautiful Panama City Beach, promises two days of some of the hottest names in music, and organizers have released the exciting full lineup for the event. Headliners Sheryl Crow and Darius Rucker will be joined by Colbie Caillat, A Thousand Horses, LOCASH and “Nashville” television star Charles Esten, and the latest additions include Craig Campbell, Delta Rae, Will Thompson, Lauren Alaina, Sammy Arriaga and Gal Friday Band. “The full lineup for the Pepsi Spring jam is creating a lot of excitement,” says Visit Panama City Beach President and CEO Dan Rowe. “Spring is always a great time to be at the beach, and having so many of Nashville’s favorite acts joining headliners Sheryl Crow and Darius Rucker gives country music fans even more reason to come put their toes in the sand in Panama City Beach.” Early Bird ticket rates remain in effect for a limited time at $199 for VIP Pit and just $69 for General Admission – plus taxes and fees. A limited number of $59 single-day tickets are currently available. Children six years of age and under may enter for free. Two-day General Admission Military Tickets are also $69 plus taxes and fees, and that price will not increase. A limited number of $30 Two-day and $20 One-Day Early Entry Passes are also available. These passes are an add-on to a festival ticket and allow ticket holders to enter the festival 30 minutes before the main gates open. This is great advantage in getting to the front of a ticket section. Visit http://springjampcb.com/tickets/ for more information. Pepsi SpringJam Preferred Lodging Partners offer the best of Panama City Beach’s resorts and condominiums. Each partner is also an authorized ticket seller for the 2017 Festival. Click here to learn more about the lodging partners. Security of patrons, artists and staff is of the utmost importance at the Pepsi SpringJam, and organizers have elected to adopt a policy of only allowing clear bags onto the festival grounds. The policy is similar to that of other music festivals and sports events and will expedite fan entry into the festival. For more information about what is permitted, visit www.SpringJamPCB.com. To purchase tickets and to get updates about the festival, artist lineup, directions, parking, lodging packages and more, visit www.SpringJamPCB.com.